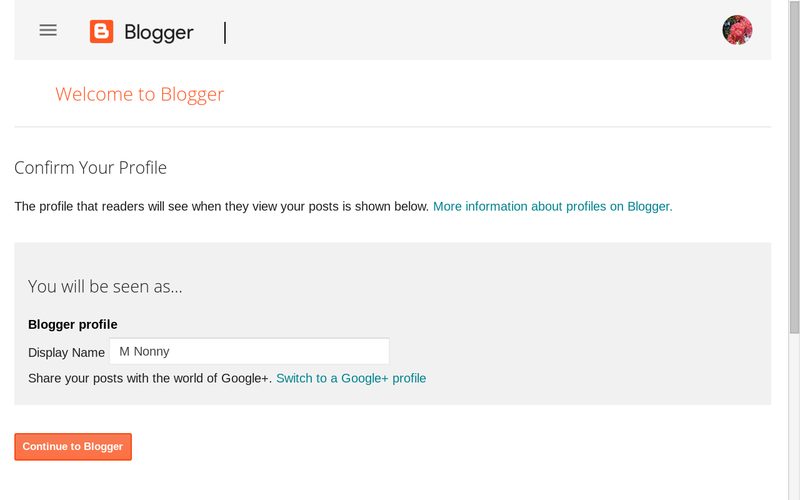 Note that if you haven't switched from a Google+ Profile to a Blogger Profile yet, jump to the end to learn how to switch. Or read on for detailed instructions. 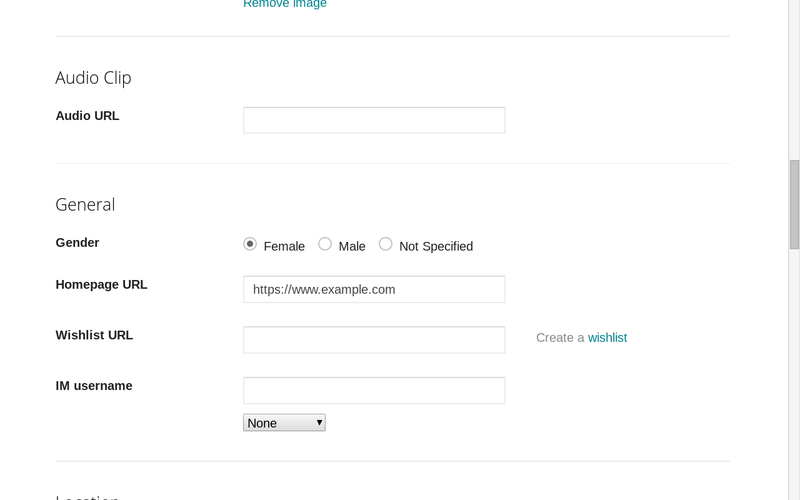 Once you have set up a Blogger Profile, you can add a profile photo and personal details, and choose whether your profile is visible to others. 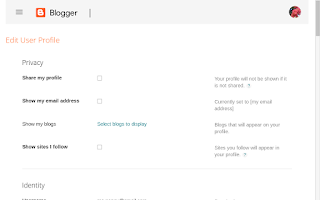 That will open your Blogger profile settings in a new tab. Show my email address enables others to see your email address on your profile. 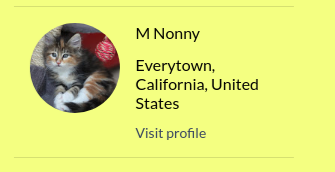 Show my blogs lets you select which blogs will display on your profile. Be sure to click Save Settings after selecting your blogs. Username is your Google Account email username. You cannot change that from these settings. Email Address if you display a contact email address, enter it here. I can be any email. You can upload an image from your computer, or you can link to an image online. 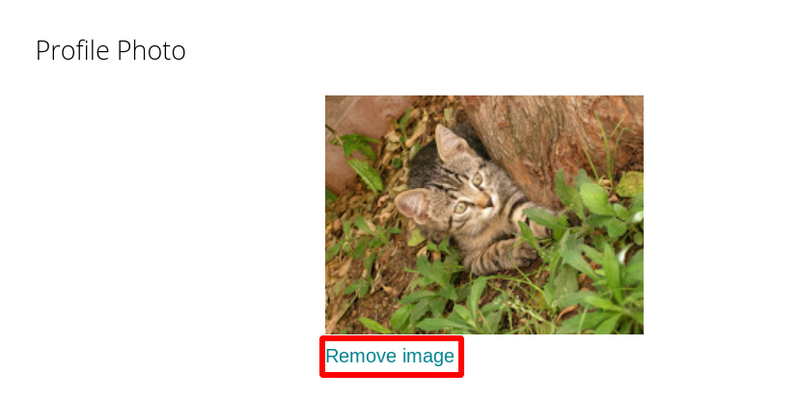 Note that if you link to an image, it has to be a link to the image itself, not the page the image is on. 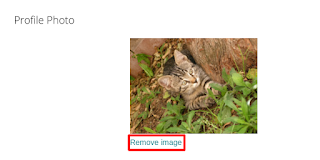 Google Photos does not offer any easy way to link to a specific image, so it's easiest to download the image to your computer, then re-upload it. Wishlist URL lets you link to a wishlist on Amazon.com or other service. Note that "Create a wishlist" links to froogle.google.com which now Google Shopping, and no longer has a wishlist option. IM Username lets you share your instant messaging username. The list of services you can select from (Yahoo, AOL, MSN, Google Talk) show long it's been since these options were updated. 6. Add your Location, Work, Interests and other information. Location, Work, and your interests will be clickable on your profile and show a list of other Blogger users with the same information. Be sure to click Save Profile when you are done! You will see a link to View your Profile. 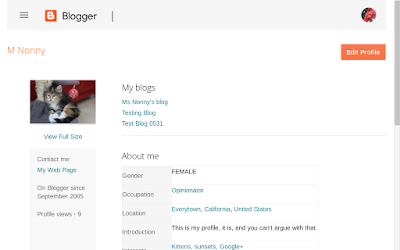 Check it out and see what other Blogger users out there have similar backgrounds and interests. 1. 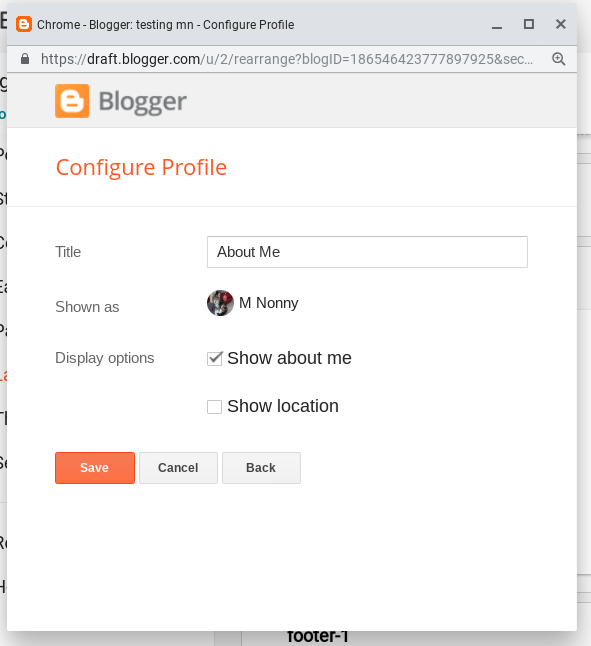 Sign in to Blogger and click Layout on the left menu. 4. Configure the Profile Gadget to add a title and choose whether it links to your profile or displays your location. 5. 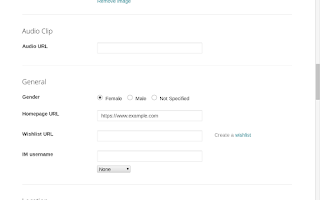 Save the gadget and drag it to the position you want it to appear on your blog's layout. 6. Save changes to your layout. The exact design of the gadget depends on your blog's theme. You can modify the theme by clicking Theme on the left menu and then clicking the Customize button. 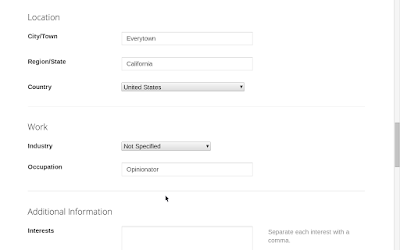 The example is a blog using the Emporio theme. Some blog themes also let you display your Blogger Profile below your posts. 2. On the Blog Posts gadget click the Pencil or Edit icon. 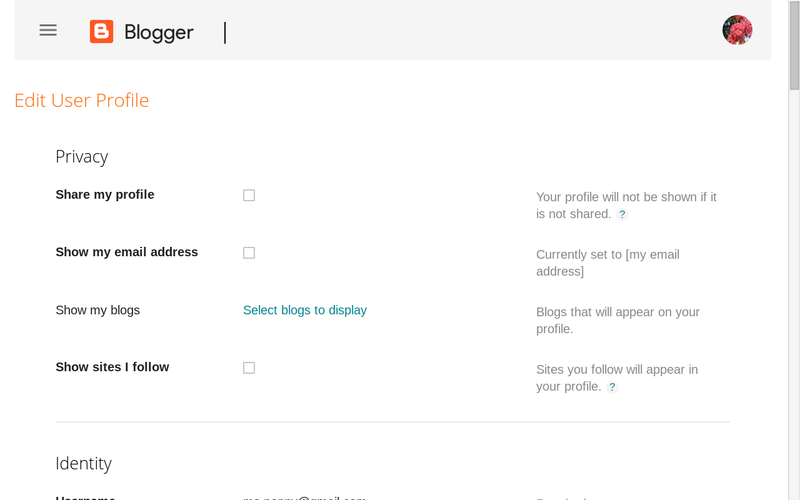 If you have been using a Google+ Profile for your Blogger account, when you sign in to Blogger you should see a notice suggesting you switch to a Blogger profile "at your earliest convenience". With the shutdown of Google+ just a few days away, now is the time! 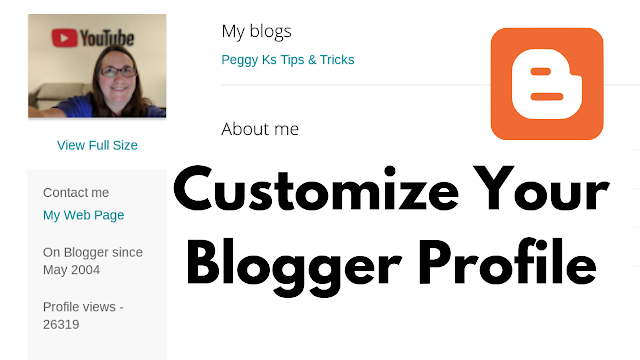 It just takes a few minutes to set up and configure your Blogger Profile. 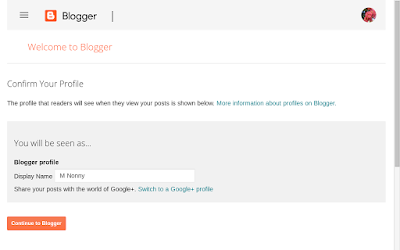 If you are already using a Blogger Profile, scroll up to the instructions for configuring your Blogger Profile above. 1. To start the process click the "here" link on the notice or go to www.blogger.com/go/gplusdeprecation-revert-to-blogger-profile. 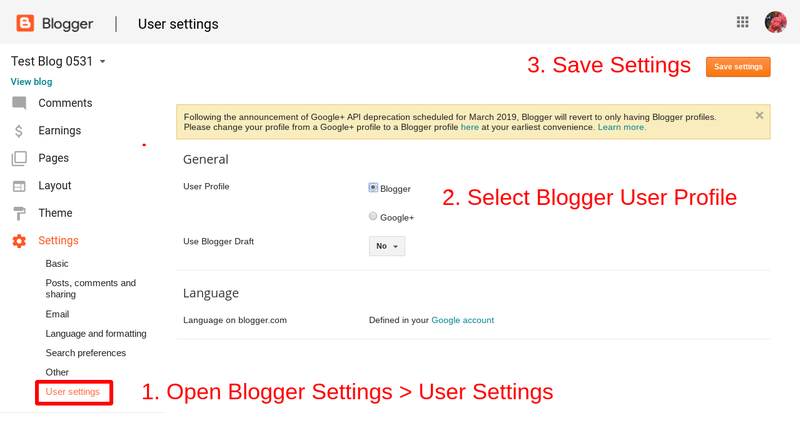 You can also start by opening your Blogger Settings > User Settings, clicking the Blogger profile option, then clicking the Save Settings button. Note that once consumer Google+ shuts down, Blogger will likely skip this confirmation step. 3. 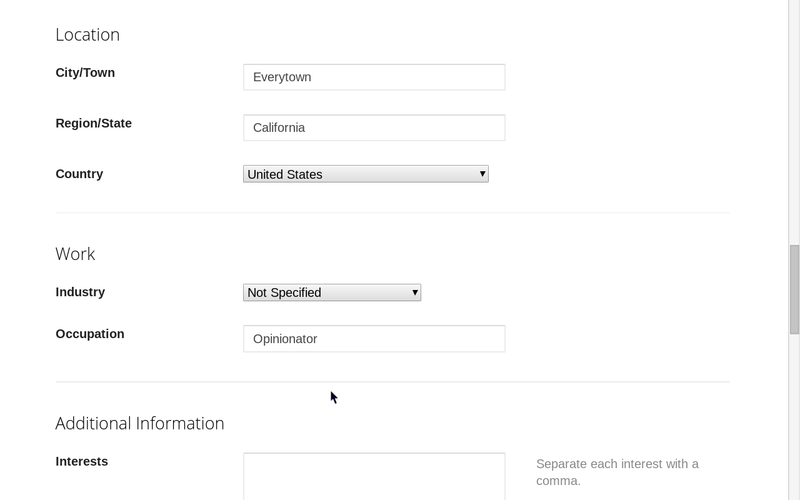 The Confirm your Profile page will open. Enter the name you want to use as the author of your Blogger blogs. This does not need to be the same as your Google account name. That will set up your Blogger profile. But it will have no profile photo or personal details. 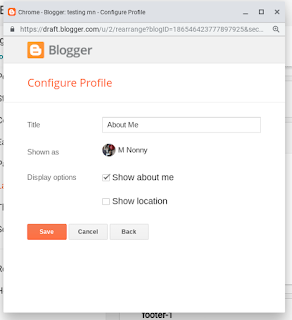 Now you can customize your Blogger profile.